Moline (population 43,768) is located in northwestern Illinois in Rock Island County. It is one of the feature cities which are part of the "Quad Cities" area located on the banks of the Mississippi River in Illinois and Iowa. The Rock River is also a main waterway which passes through Moline. The area was shaped early on by its location near these rivers. Railroad lines were the second major mode of transportation bringing folks to the Moline area. Roadways soon followed. Illiinois Routes 5 and 92, U.S. Routes 6, 67, and 150, and Interstate Highways 74 and 80 all lead to Moline. The St. Mary's Parish was the first Catholic parish in Moline. Moline began an educational system for its children in the early stages of its growth. The Catholic Church realized the opportunity and need for education and established a school in Moline. St. Mary's began as a one-room school in 1884. A larger building was built to house the growing student population in 1896. In 1926 a "modern" brick structure was built for the high school and it flourished for nearly 25 years. In 1949 a new Catholic high school was built in Rock Island (Alleman). It was decided by the archdiocese to close St. Mary's High School in Moline and have just one Catholic high school for the immediate area. 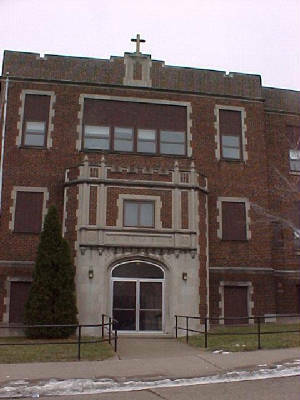 St. Mary's continued as a grade school for the Moline area for several more years. It, too, eventually ceased being used in this capacity. The former St. Mary's High School building is still functional though is now used in a different capacity by the St. Mary's Parish. A well-written and researched report regarding the history of St. Mary's High School in Moline was written by our good friend, Richard Soseman. Richard's report follows directly after the "Quick Facts" portion of this page. Who come from the seas. Ring out, for you and me. Territory near Moline was settled very early in the 1800's. Campbell's Island, a few miles upstream, was chartered by George Washington and the US Congress to Judge Mac Neil for the grazing of animals. Soon after his invention of the self scouring plow, John Deere moved his workshop from the small town of Grand Detour, Illinois, to the bustling city of Moline, in 1842. The city remained partnered with the other "Tri Cities" of Rock Island, Illinois and Davenport, Iowa. The beginnings of Catholic worship in Moline date from the visit of Fr. Marquette and Joliet, in the 1600's. In the 1850's the parish of St. Anthony was founded. This parish was replaced by St. Mary of the Assumption, founded in 1878. This was a time before universal public education of students was a reality, and so the Catholics of Moline asked that the Sisters of Charity, B.V.M. open a Catholic school at the parish, which soon instructed students of all grade levels. This school opened in 1884.
room for the seating of 295 children." 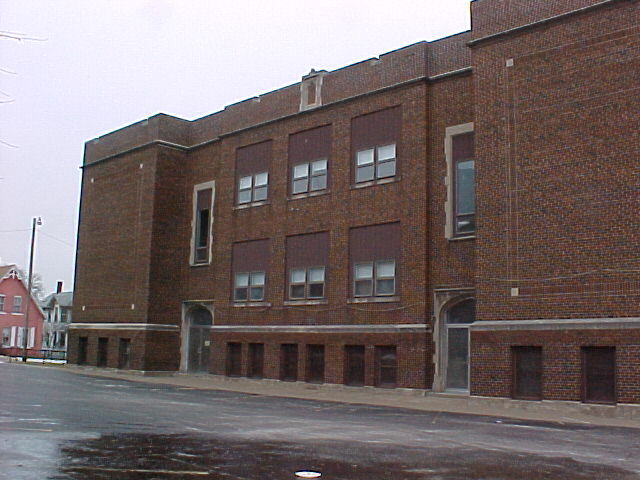 The school continued to grow and flourish, along with the parish and the city of Moline. In 1907 a new parish was opened in Moline, and Sacred Heart Grade School was started. This diminished the number of grade school students at St. Mary's but the school remained the only Catholic high school in Moline. In 1916 Benedictine Sisters came from Nauvoo to teach at the school, and served there until the school was closed. In 1926 it was determined that St. Mary's should increase from its two year high school format to a full four years. Thus the need for a new school building to house the high school was recognized. The cornerstone for the present school building was laid on July 29, 1926. No expense was spared to make this building both beautiful and practical. Limestone facing was installed and small sculptured heads were integrated in the design of the entrance to the school. Special techniques were used in the brickwork, in order to enhance the beauty of the school building. In 1949 Alleman Catholic High School opened in Rock Island, and St. Mary's School continued only as a grade school until Seton Catholic School was formed in 1977. Alleman opened with 229 students from Moline, and 61 from East Moline. It would seem that St.Mary's High School at its close had a student population in the 200s. The 1926 building is still used, but daily classroom use ceased in 1998. The gymnasium of St. Mary's was elaborate for its day, but the basketball court was smaller than normal size. The walls were elaborately tiled, and the balcony over the main entrance contained a projection booth, so that films could be shown on the screen on the stage. There are two rows of bleachers- actually painted benches on a wooden frame, on each side of the court, the teams sat in the front row, with the fans immediately behind. Moving around during play was prohibited, as there was no room to move between the bleachers and the court without interfering with play. One can only imagine what the gym must have been like during these high school games. From my grade school experience playing there, I have one guess- LOUD & HOT. Any cheer shouted from the sidelines was echoed a hundredfold. You could never hear anyone, the roar of the crowd was so loud. Play there was very physical, as the court was compressed and there was not much room. What an experience! A grade school team photo from 1924 certainly reflects the names of those who played for the high school a few years later: Weaver, Sonneville, Carton, Goethals, Merchie, VanderHeede, Creen. In those days, the assistant Pastor of the parish was often also the Basketball Coach. In October, 1992, a reunion was held for all alumni of St Mary's High School. A booklet was made for the occasion, listing all of the remaining alumni who were locatable. 159 of the students who attended the school in it's last days of Spring, 1949 were listed. "Our class, 1958 just celebrated our 50th at Rock Island in 2008. I have given you a link to our memory book, almost completed, if you are interested. It is more about the class than St. Mary’s in particular."